You are currently browsing the monthly archive for August 2015. The notorious annual dolphin drives are scheduled to begin near Taiji, Japan, on September 1 and will continue until at least March. Every year, fishermen locate pods of migrating dolphins out at sea and herd them into Hatagiri Bay with boats, nets, and long metal rods that crew members dip below the surface and pound to create an acoustical wall that disorients the dolphins’ sonar. The fishermen leave the animals overnight in a narrow cove and return at dawn armed with the knives and spears that will gradually turn the blue tide scarlet. While many dolphins are killed for meat, others are sold to zoos and marine parks worldwide, making the drives an incredibly lucrative business. Some say this could be the final season for these hunts. The World Association of Zoos and Aquariums (WAZA) has ordered the Japanese Association of Zoos and Aquariums (JAZA) to stop purchasing dolphins captured in Taiji or be permanently suspended as a WAZA member, and JAZA members reluctantly agreed. 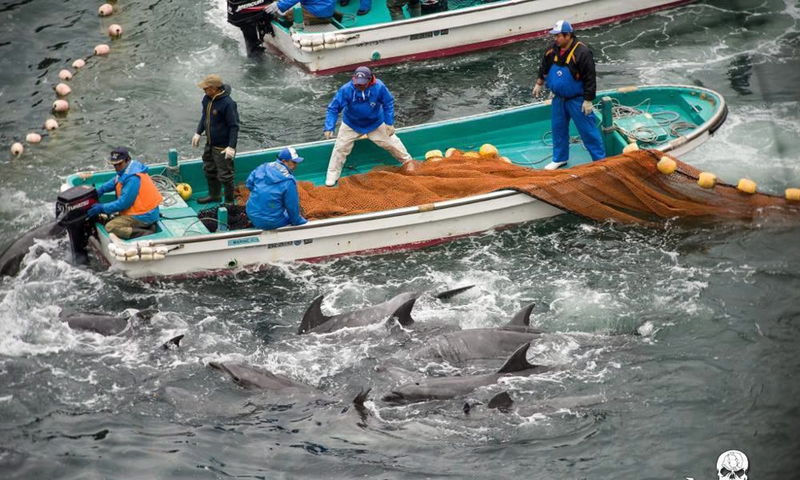 If all the Japanese aquariums follow through on their pledges to stop buying Taiji dolphins, it could render the entire Taiji dolphin killing operation uneconomic and unsustainable. But activists and nonprofits are not waiting. Taiji will still be able to export live dolphins overseas to aquariums and zoos that are not WAZA members, including those in China, Russia, and the Middle East. Groups such as Sea Shepherd and Ric O’Barry’s Dolphin Project will be in Taiji to monitor the drives and bear witness to the suffering. 1. Educate Yourself. Watch The Cove—the Academy Award-winning documentary about the Taiji drives—or read Salt Water Tears by Len Varley. I also examine this issue in my book Bleating Hearts, for which I interviewed renowned dolphin trainer-turned animal advocate Ric O’Barry. Then share your knowledge about this issue with others. 2. Don’t Buy a Ticket. The captive-dolphin entertainment industry gets rich from dolphin suffering and death. By boycotting their profit stream, we can sink them economically. Don’t patronize any parks that keep dolphins in captivity, including places that offer swim-with-the-dolphins programs. Encourage your family and friends to stay away from these businesses, too. 3. Sign Up for Dolphin Day. Join individuals, activists, and organizations around the world by participating in this International Day of Action on September 1. Click here for information. 4. Speak Up. Contact authorities in Taiji, as well as the Japanese Embassy, US Embassy to Japan, US and Japanese Ambassadors to the UN, and the US Senate members of the Committee on Foreign Relations. Call or send them a polite message expressing your feelings about the dolphin hunts and ask them to do everything in their power to help put an end to the misery. 5. Join Volunteers in Japan. Sea Shepherd and the Dolphin Project are both looking for people to travel to Taiji. Those who are interested in volunteering as a Sea Shepherd Cove Guardian for Operation Henkaku should email groundcrew@seashepherd.org. (Please note that volunteer applicants must be able to commit to participating in the campaign for a minimum of one week.) To sign up to join Ric O’Barry and his Dolphin Project team as a Project Cove Monitor, please click here.